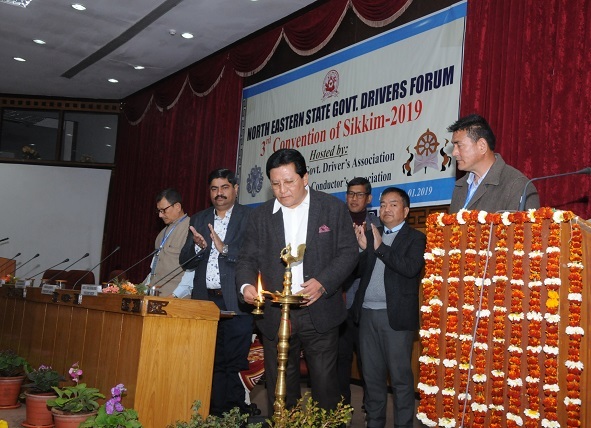 The third convention of North Eastern Government Drivers Forum was held at Chintan Bhawan in Gangtok on Sunday. The programme was graced by Sikkim Minister for Tourism & Civil Aviation, Ugen T Gyasto as the chief guest. Addressing the programme, Minister Ugen T Gyatso welcomed all the delegates from the north-eastern states and hoped that they take very productive and positive message from Sikkim. He said that drivers are ‘the face of the state’ as they are among the first contact persons in the state for any visitor. He added that drivers should have the ability to manoeuvre the vehicle safely in high traffic and adverse weather condition and interpersonal skills along with a warm approachable manner, good technical knowledge of vehicles. Since driver means ‘Discipline Respect Intelligent Vision Efficient Responsibility’, there should not be discrimination against drivers. He stated that women drivers should also be looked as an example of women empowerment. He briefed about the recent implemented programme about the ‘one job one family; scheme implemented by the State Government and added that it is the first of its kind programme in the world. He highlighted that in case of an accidental death of a driver belonging to any state, an ex-gratia sum of Rs five lakh is given on the spot. He further requested to All Sikkim Government Drivers Association not only to focus on government sector but also to focus on private drivers, mainline taxi drivers’ association etc. Earlier president of All Sikkim Government Department Association S Zangpo had submitted a memorandum to Minister Ugen T Gyatso, where all the grievances were laid down. He said that drivers appointed on regular establishment till their retirement drivers are stagnant on same post and requested for the provision of promotional benefit. He further stated that the drivers are provided with the benefit of grade upgradation for three years that is, on interval of 10, 20 and 30 years which is not at par with the benefit that other government employees are provided with. He further expressed that since 25 years and above all shall be having same gradation, thus on selection, gradation system be implemented to the post of inspector so that same could be benefited by the drivers which would be equivalent to other skilled employees serving under Government of Sikkim. President of North East Government Driver Federation Forum K Ibomcha Sharma said that there should be ‘equal pay for equal work’ quoting an example between central government drivers and Manipur government drivers.